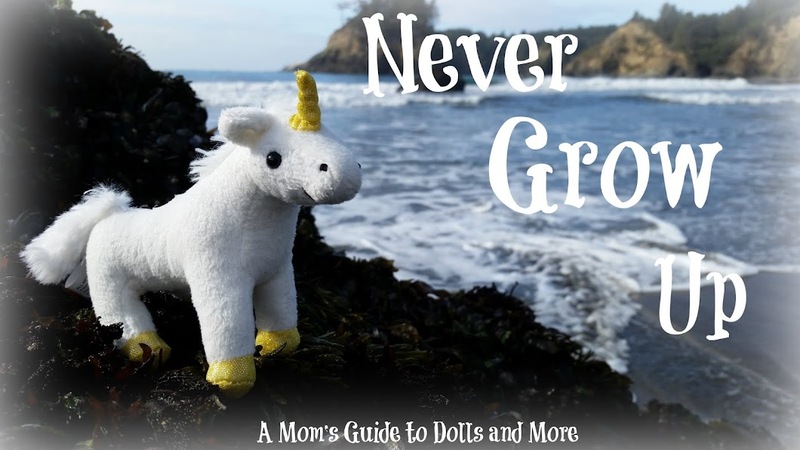 It's hard to grasp that it's been six years since I sat down and started this little blog. It's fascinating to go back and see how it has grown, developed, and changed over the years. ...and a cute little pin that comes with her. The winner will also receive this sweet Little Kingdom Snow White doll. Next we have a blind-bag-sized My Little Pony Applejack with her bed and blanket. Since I just recently discovered the Twozies, I thought it would be fun to include a couple of pairs in the giveaway. :) The winner will receive two Twozies pairs and two display boxes. And finally, I wanted to include something for the 18 inch crowd as well, so here is a cute Cat in the Hat "book" for 18 inch dolls. It's actually blank inside, but still looks really cute on display. 6. Because I'll be gone on vacation all week, this giveaway will be open until Sunday, August 7th. 7. On Monday, August 8th, I will pick a winner through a random drawing and email them to get their mailing address. The winner will have one week to respond. If I have not heard from the winner by Monday, August 15th, a new winner will be chosen. Thank you again for a wonderful six years together. :) I appreciate you all more than you know. So here is handsome Kristoff in his new box. I find it interesting that the Frozen "Classic" dolls still are labeled by their movie. 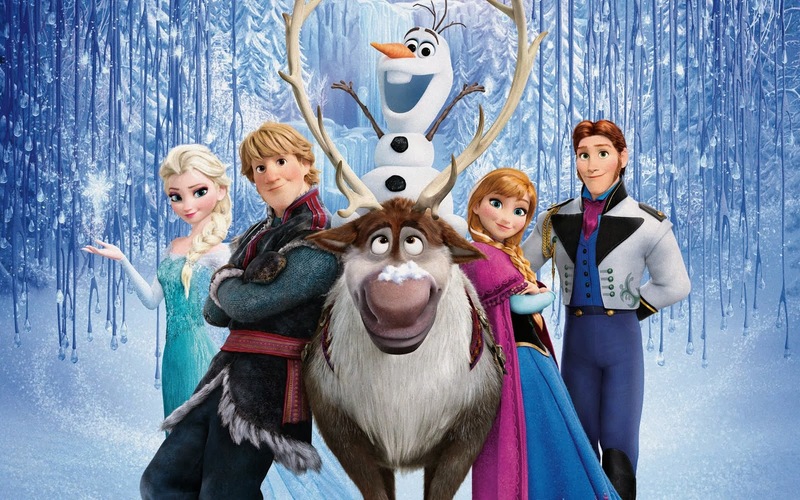 Frozen is still pretty big, so maybe they're wanting to continue to cash in on its success. It's interesting, though. I've noticed that Frozen has been getting some hate lately, both online and among my acquaintances. I think people are getting burned out by it, almost like its huge success was "too much of a good thing," to borrow the cliche. That, and I think most parents are sick of hearing "Let it Go." ;) My brother and his wife pretty much can't stand the movie, but they have four-year-old and two-year-old daughters, so I'm sure they've heard it A LOT. ;) Have you guys noticed this? Kristoff's box was not nearly as cooperative as Rapunzel's and Belle's, so it was pretty mangled by the time I got it to this point. I was pleasantly surprised by the quality of his outfit. Normally the Classic Prince dolls have clothing made from pretty cheap fabrics, especially compared to their original releases. Kristoff's vest was a little thin, but still had nice decal details. And his shirt was a nice, thick material. His pants felt fairly sturdy, too. And I love the vibrant color of his red sash. His vest is removable, which was a pleasant surprise. Again, it's a thinner material, but has nice detail. A closer look at the trim decal. My only concern is that the inside of the vest is lined with this netting material that is not hemmed on the edges. I imagine this will be quick to fray with playtime. I wanted to compare this Kristoff with the original Disney Store Kristoff that was released at the time of the movie. Their faces are very similar. Original Kristoff has pinker cheeks, darker hair, and subtler freckles. I think I prefer the freckles and coloring of Original Kristoff, but I like the lighter hair of 2016 Kristoff. It reminds me more of his hair in the film. They appear to have almost identical boots. Perhaps 2016 Kristoff's are a little darker. Kristoff is on the Disney Store website HERE. You can get him for $16.95 individually or $12 when you buy two or more Classic dolls. I have to say, I'm a little disappointed they raised the "2 or more" price to $12 each instead of $10 each. I'm glad I bought my dolls last month under the old promotion. A difference of $2 per doll isn't huge, but every little bit adds up. Hope you guys enjoyed the reviews for this year! :) Now I really need to start getting ready for my trip. ;) Especially with church and a blogoversary post tomorrow. You can see my full review of the original Kristoff doll HERE. I am not affiliated with the Disney company, and do not receive anything for these reviews. I'm just a Disney doll fan who loves sharing with fellow fans. :) All thoughts and opinions expressed are my own. And I can't even begin to say how much I'm drooling over the beautiful upcoming Limited Edition Beauty and the Beast dolls. Belle was announced a while back, but just yesterday the Disney Store shared pictures of the Limited Edition Beast and Gaston dolls that will also be available for pre-sale on August 2nd in select stores and online August 3rd. You can read all about it and see pictures HERE on the Disney Store blog. I've shared before my desire to someday own a Disney Store Limited Edition doll, especially from Beauty and the Beast. Silly me, I was thinking of the dolls that would probably be released around the time of the live action version of the film next March. I didn't even think about the 25th anniversary of the animated version and the dolls it might inspire. Okay, enough of that! On to the pretty new Belle doll that IS in my collection. 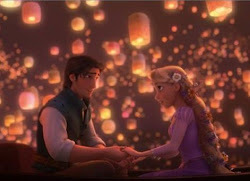 ;) Like my Rapunzel review for this year, 2016 Belle's post will be a little less detailed and more of an overview. Here's Belle in her box. I really love what the Disney Store has done with the packaging this year, including scenes from the movie in the backdrop and making everything so bright and cheery. There are even little motifs from each film on the boxes this year. Like I mentioned in Rapunzel's review, I think this could be a fun way to display your dolls if you wanted a nice backdrop but still wanted to at least partially debox them. And here she is, free from her plastic and cardboard prison. Belle's dress this year is a huge improvement from last year's, although it's VERY glittery (sorry for those of you who are not glitter fans). It appears to be similar to the Palace Pets version of Belle from the Disney Store last year, except the trim at the top of the bodice and around the skirt is satin instead of the gauzy, see-through material on Palace Pets Belle's dress. It looks much closer to the movie version of the dress, including gloves this time (yay!) and a skirt that is much fuller and closer to the original dress design. The dress has Velcro closure in back. There is a slight gap at the skirt where the twist ties held her to the box, which is pretty common for these dolls. The skirt fits correctly, so with time this should lay flat. 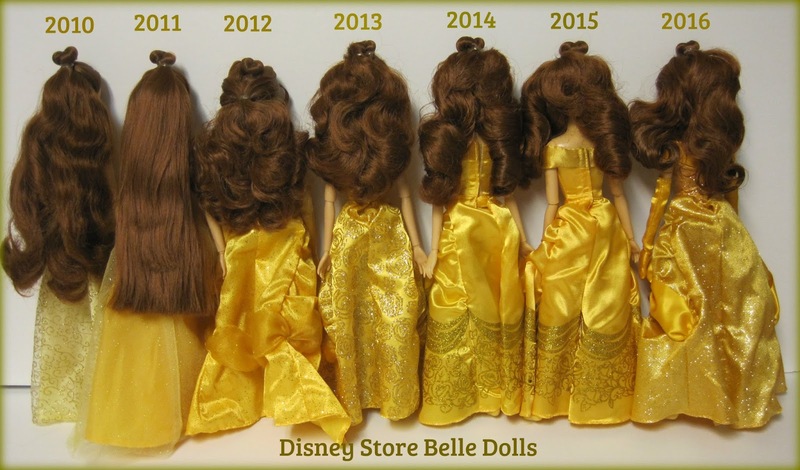 Belle's hair has the typical odd separation in the back due to the way she was packaged. However, I do appreciate that it is about the right length and style. She has a lovely, gentle face. Like 2016 Rapunzel, 2016 Belle's face is almost identical to last year's, but has subtler makeup and rosier cheeks. My particular Belle had a very slight paint flaw on her right eyelash line, and paint that overlapped the eye line in the face mold (also on the right). Now, let's take a peek at Belle's little companion, Chip the teacup. I have to say, I was pretty disappointed in Chip's paint job. I've seen really cute sidekicks come from the Disney Store, but honestly, this Chip looks like one of those poorly painted Disney toys you can find at dollar stores. With a little more detail and subtler paint, he could have been so much cuter. 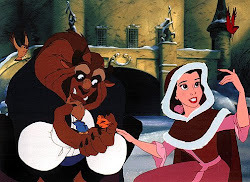 He does look pretty adorable with Belle, though. I love that he can sit in her hand, just like he did in the movie. I'm so pleased with this doll overall. I especially love her kind face and the detail of her dress and gloves. And here they all are from the back. 2011 Belle (pictured next to 2010 Belle) looks closer to her movie counterpart. I've always loved the sweet, innocent expression of her face. 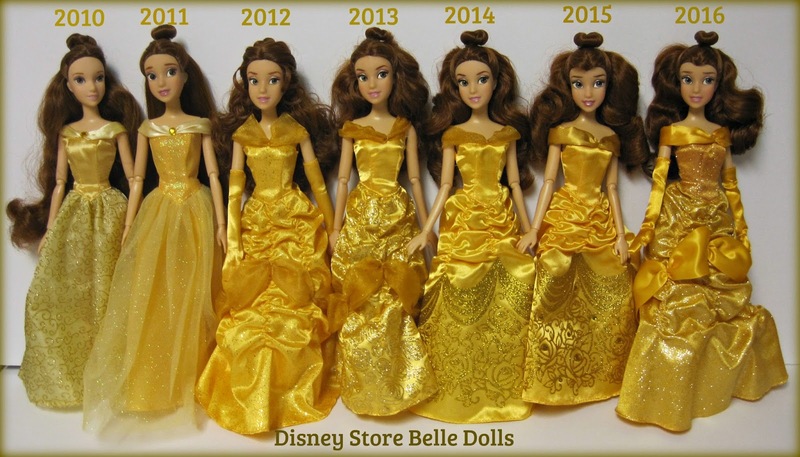 2015 Belle (next in line) is probably my first favorite of all of the dolls. I love her coloring and the beautiful detail of her face paint. It's a tie for this category as well. Overall, I like 2016 Belle's dress (on the right) the best. However, 2012 Belle's dress is lovely, too. Both dresses include Belle's signature gloves. And 2012 Belle's dress has the added bonus of a dress design that continues all the way around the skirt, even in the back where it's not visible from the box. Again, 2012 Belle and 2016 Belle are the winners. Even though 2012 Belle's hair isn't as accurate to the movie style, it is designed to look like Belle's updated look from that year, when the marketing designs of all of the Disney Princesses got a makeover. I especially love the curly tendrils that frame her face and the fact that her little topknot bun isn't up as high on her head and looks more natural. 2016 Belle's hair looks lovely in photos and is very movie accurate (aside from the height of her bun). 2015's is pretty similar, although my 2015 Belle's hair was even more separated in the back (which you can see in the group photo above). Beauty and the Beast will always be my favorite Disney movie. I can't believe it's been twenty-five years since I sat in theaters as a ten-year-old girl and watched it for the first time. Belle was the first princess who had brown hair like mine, who loved to read, and who was deep enough to not fall in love with the first handsome guy she saw. ;) I instantly related to her. I'm so pleased to have such a lovely, detailed version of her for my collection. To read my past Belle doll review posts, visit my Doll and Toy Reviews page and check under the "Disney Dolls" category. I am not affiliated with Disney, just a fan who loves to share about my Disney dolls. ;) All thoughts and opinions expressed are my own.